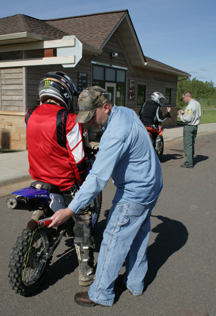 The Iron Range OHV State Recreation Area is monitored by on-site DNR staff who enforce regulations. Alcohol is not permitted in the facility. You need to check in at the office before entering, and check out when you leave. We enforce vehicle emission sound test requirements on site. Mufflers must have a federally approved spark arrestor. Overall noise emission from ATVs and ORVs may not exceed 99 decibels at a distance of 20 inches. OHMs manufactured after 1986, may not exceed noise emissions of 96 decibels when operating on public lands. Mufflers may not be altered to increase motor noise, or have a cutout, bypass, or similar device except for organized events. Your vehicle must be registered to enter the State Recreation Area. See the OHV regulation webpage for more information. OHV registration is available at local Deputy Registrar of Motor Vehicle offices, DNR License Center and at the State Recreation Area. It is best to purchase an OHV registration before visiting the State Recreation Area. We recognize OHV registrations from other states. If your state does not have OHV registration you will have to purchase a non-resident state trail pass Minnesota OHV registration. Non-resident operators must purchase a non resident OHV state trail pass, unless operating vehicles registered in Minnesota. It is strongly recommended that everyone wear a helmet on all vehicles; however, anyone under the age of eighteen must wear a DOT approved helmet on ATVs and OHMs. Review the OHV regulation book on the OHV regulation webpage for more information.. Persons born after July 1, 1987, and are over 16 years of age, must have successfully completed the ATV Training and CD course. For ATVs, Children under 10 may not operate an ATV on public property. Safety training is required for those under 17, see the OHV regulation webpage for more information. For more information on the safety course, or for a duplicate safety certificates, call the DNR Information Center, Twin Cities 651-296-6157, 1-888-646-6367, or DNR Safety Training Program Headquarters 1-800-366-8917. There are businesses that rent OHVs. Check out the Iron Range Tourism Bureau. Dealerships can be found in Eveleth, Nashwauk, Hibbing, and Tower. Camping is available at the City of Gilbert Campground, for more about other facilities see our area information page. The State Recreation Area is located in an old red iron ore mining area. Orange and red stains are possible on clothing and equipment!